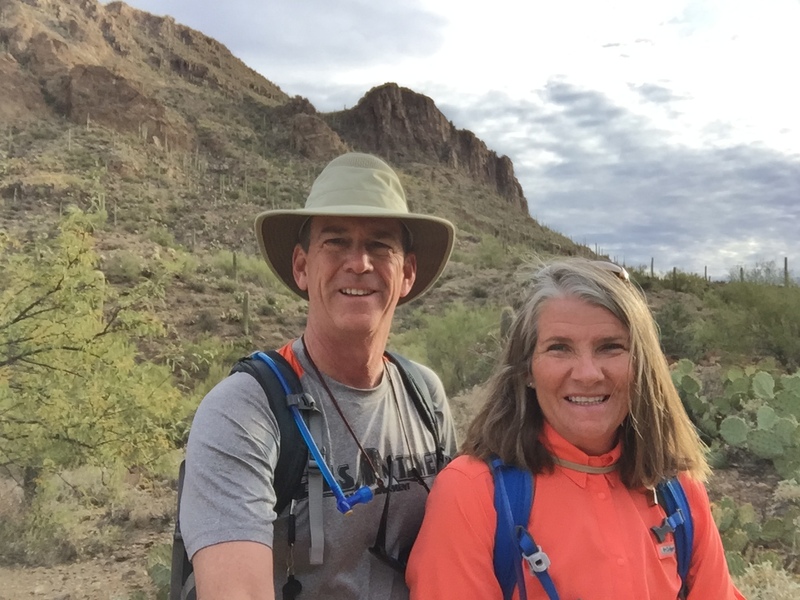 We have decided that since our eventual house is located on the far east side of Tucson, that while we are here in our RV at Davis-Monthan, we should focus our next couple months toward hiking on the west side of town. Either in Tucson Mountain Park or in Saguaro National Park West. The trailhead starts with a short climb, then a split through a small saddle between Bren Peak and Golden Gate Mountain. 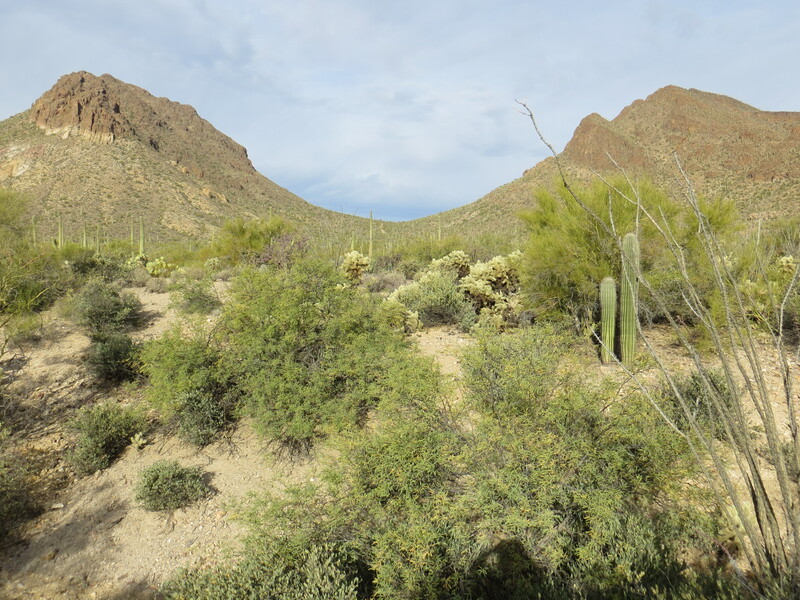 Then descends down a slope into large flat valley full of prickly pear, cholla, and saguaro cactus. 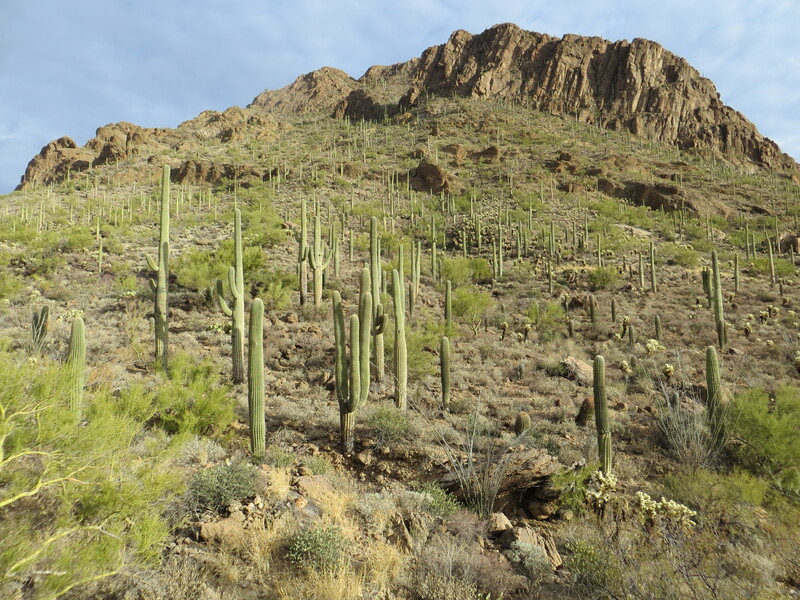 It was a very densely populated area with tons of large, old saguaros. Starting out, the weather was actually pretty cool, only about 58 degrees, with some cloud cover and a light breeze. At the time, Craig was even wishing he had brought a windbreaker or long sleeve shirt. Not to worry, as the day progressed the clouds dispersed, the sky turned clear deep blue, the breeze ceased and the sun warmed it up to the tune of about 78 degrees by the time we were done. 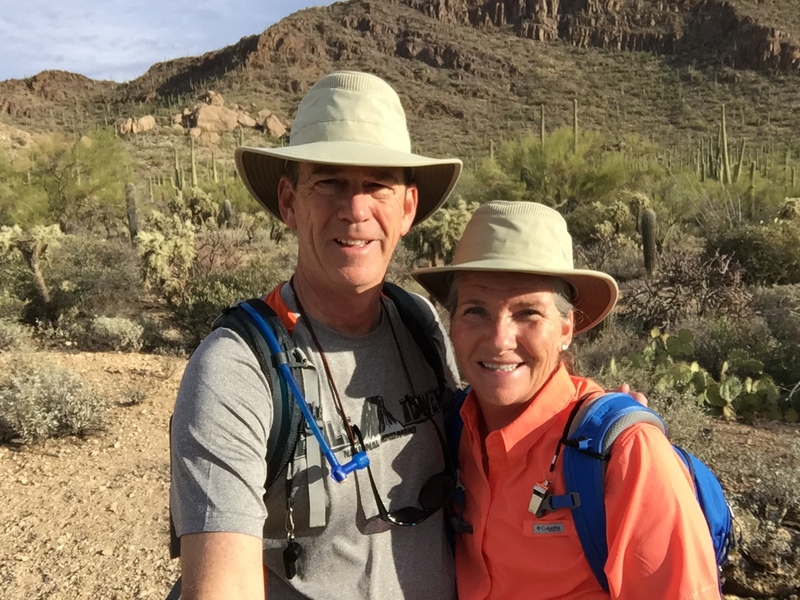 We were really enjoying the flat valley and the beautiful scenery and kept our hike going until the intersection with the Starr Pass loop trail, about 4 miles out. The total trail is actually about 6 miles out, then 6 miles back. We decided that we better not push our luck, knowing we had the long climb back up out of the valley to conclude the hike. We stopped for a short snack at the turn around, put the sun at our backs and headed back on the return trip. We had hoped that getting started early in the morning would reward us with some wildlife viewing opportunities. Though we were a little disappointed not to see any of the larger local inhabitants, we did see and hear plenty of birds, singing and fluttering around. 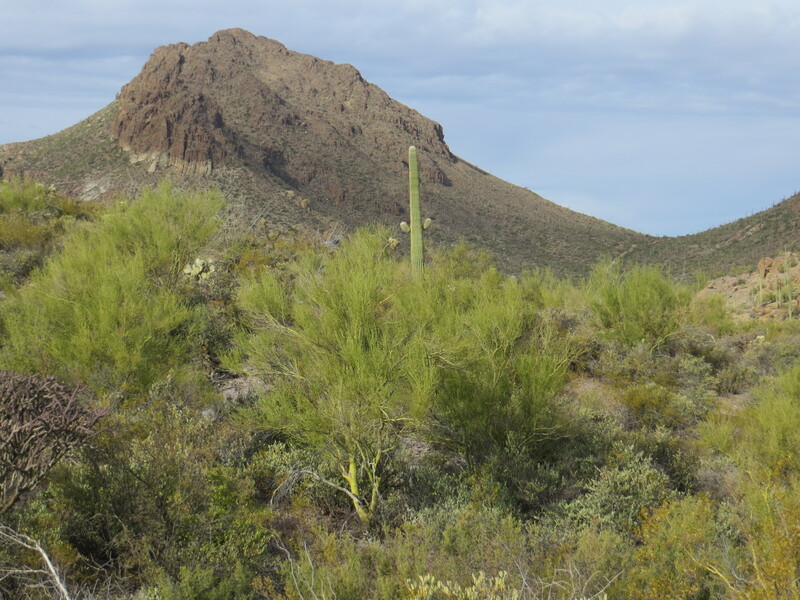 About half way back, we spotted a crested saguaro. 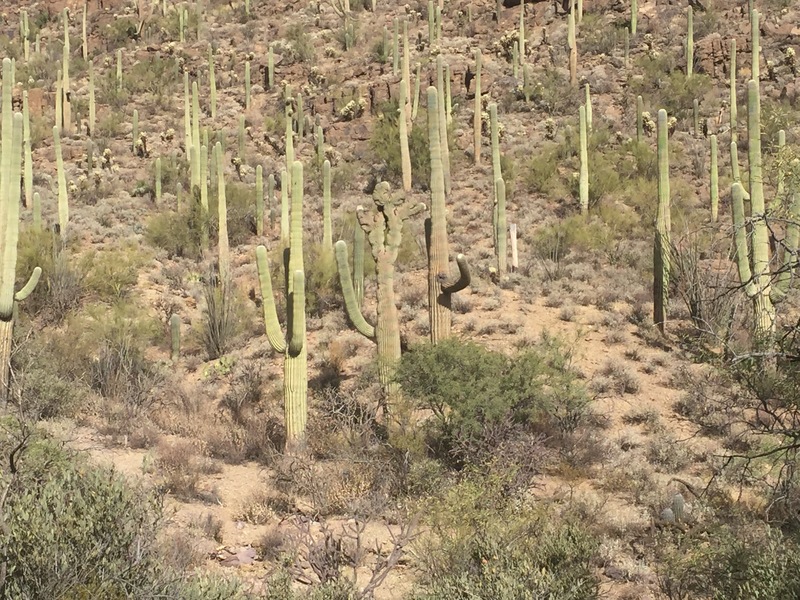 Those are saguaro whose growing tip occasionally produces a fan-like form which is referred to as crested or cristate. They are pretty rare and always a treat when you stumble on one. Though the hike back was mild, our apprehension toward the climb out proved warranted. It was just a shallow, slow climb of about 380 ft over about three-quarters of a mile. However, the combination of the sun, temperatures, lack of breeze, the total length of our hike, and not to mention our ” out of condition” state managed to “kick our butts” on the way up. We paced our selves and stopped to “enjoy our surroundings” and managed just fine, thankful that the last quarter mile was downhill back to our jeep in the parking lot. Getting an early start and keeping the pace we managed meant we were too early to eat lunch on the trail. 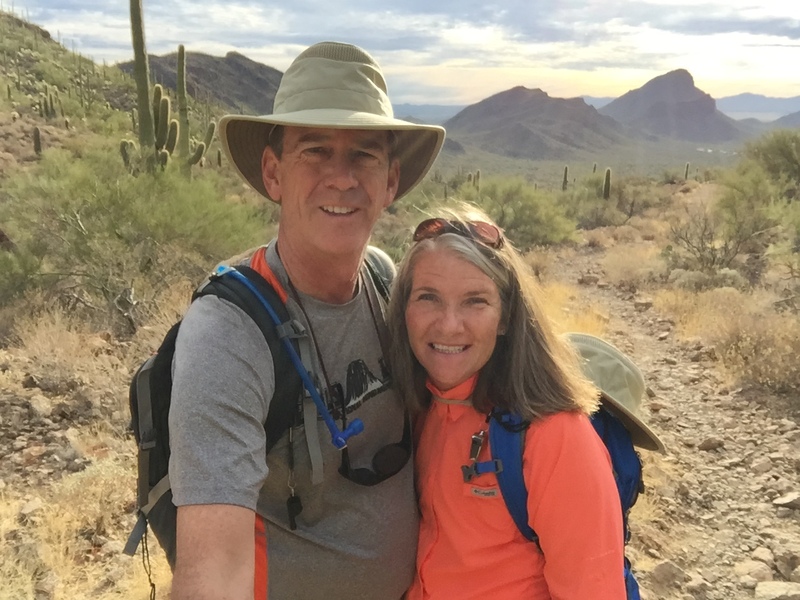 So we took our packed trail lunch, headed up to Gates Pass overlook and found an nice spot in the shade with a gorgeous view of Saguaro National Park-West instead. 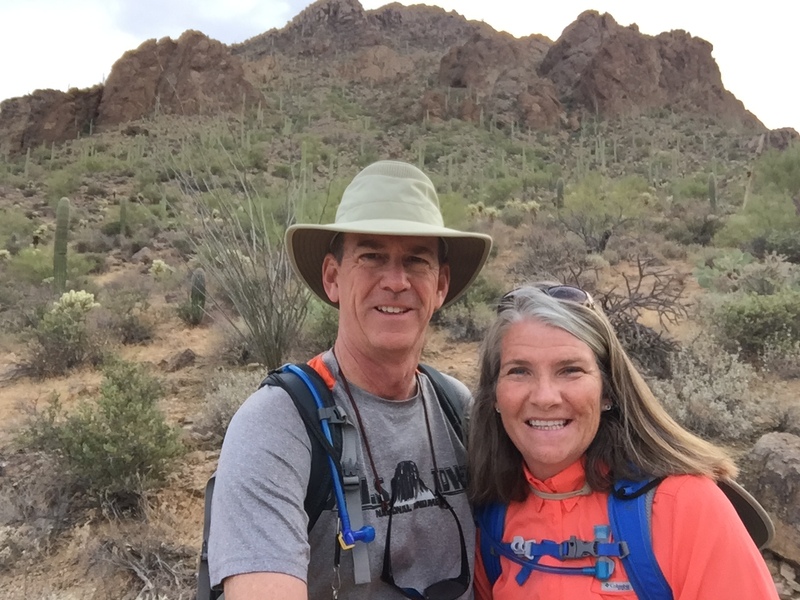 No matter how many times we go out and no matter where we hike we are constantly amazed by the beauty, ruggedness, austerity and uniqueness of the Sonoran Desert. This hike was another reminder of why we enjoy hiking this area so much.